IDSuperShop presents ID card systems from Evolis that offer the best value as the lowest cost of ownership and lowest cost per print! 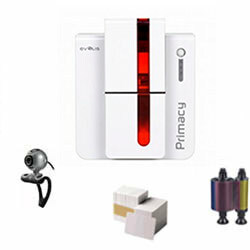 Evolis printers are a great fit for all kinds of ID card printing applications including membership, food service, non profit, education, high school, college, university, corporate and government clients. The Primacy is one of our best selling models and features a three year printer unlimited prints warranty plus free ID software with every printer purchase. Evolis ID card systems are used in applications around the world.